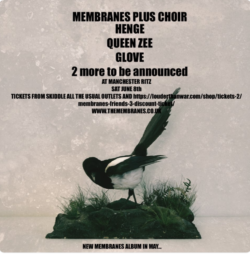 Sunday evening gigs in Glasgow are reputedly a balmier, halcyon affair than midweek fixtures around the city, mirroring the Glastonbury Sunday teatime slot often filled by legendary artists. 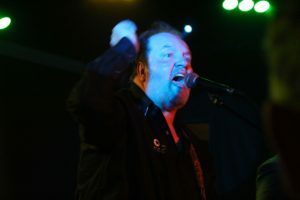 Inside the crepuscular den that is Glasgow’s O2 ABC, Liverpool luminary Pete Wylie and the Mighty Wah were the city’s prime draw, returning with ‘Pete Sounds’, Wylie’s first studio album in sixteen years. Louder Than War reviewer Stephen Watt and photographer David Wardrop headed along to welcome the post-punk hero into the next millennium. Original punks and mods filtered through the doors, affording deserved attention towards the stage during first support act of the evening, Neil Sturgeon’s set. As becoming of early performances, crackly leads and occasional puffs of smoke belching out of machines at the side of a clustered stage mercifully did not detract Sturgeon from demonstrating his stamp of folksy-pop. 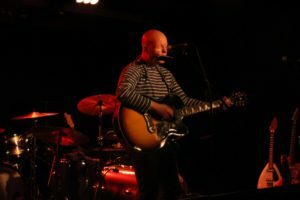 A sweet version of 1980’s cowpunk band The Long Ryders “Ivory Tower” was warmly received, and Sturgeon’s glossy croon evinced the stylings of an experienced musician proficient with his gift. “You’ve got to ride the tide before you reach the shore”, Sturgeon’s lyrics often intimated bittersweet stories which tonight’s headliner is so often revelled for. In contrast, the advent of Glasgow band Van Impe (named after celebrated Belgian cyclist and mountain climber Lucien Van Impe) heralded a throwback to underground New York in the 1960’s. Frontman Stephen Davis is an apparition of Andy Warhol, bespectacled and foppish, but lending a wonderful growl during a cover of The Cramps “Goo Goo Muck”. Van Impe is a band that hatches pterodactyl eggs with their music – something which appeared in the past but importantly, you can’t stop watching, eager to see its results. Reverberating guitars and quivering drums playfully carry the classy song “Wellington Street”, unusually sang by Davis as “where I want to be” after lead guitarist Mark Tuffley was attacked in the Edinburgh street, while the distorted intro, wailing guitars, and Neil Menzies’ Epiphone bass guitar create a wall of wonderful intonation during pick of the bunch, “Predilection”. 1967 song “I’ve Got Levitation” by The 13th Floor Elevators was subsequently covered by Pete Wylie’s friend and former bandmate Julian Cope in 1986, so it was a rousing, animated finale by the Van Impe lads to close their set with this number a further thirty years on. The band appeared more at ease collectively performing the covers but succeeded in firing the now-swollen crowd up for the main event. As the Mighty Wah! band entered the fray, Glasgow was clearly delighted to have Wylie back upon a stage since first appearing in King Tuts a number of years ago. Whether his fans discovered him through his many incarnations of Wah!, The Farm, the KLF, or other it was a strong and loyal connection engaged between the Liverpudlian with his Glasgow fan-base, most of whom were ages with the almost 60-yr old. During “Come Back”, Wylie’s petition to fight for what you believe in, turned a two-minute pop song into a Tory-jibing speech in support of the NHS as the band reduced the volume and allowed time for spoken word to breathe. This led into the positive power of punk as “Better Scream” was delivered in honour of Wylie’s recently-departed pop pal Pete Burns, an energetic and upbeat number with more than a sprinkling of The Byrds in its guitars (Wylie would later drop the chorus of Dead Or Alive’s “You Spin Me Round” into Wah! Heat’s “Seven Minutes To Midnight” – a nice touch). It was encouraging to see a band smiling and enjoying themselves with each member regularly pointed at by Wylie when it was their turn to shine, deflecting the attention away from his very strong opinions and stories between songs. 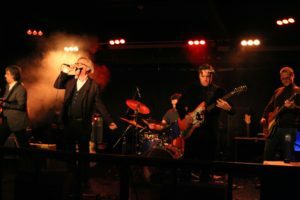 It was no surprise that “The Day Margaret Thatcher Dies” and the sublime “Sinful”, which led into a cover of David Bowie’s “Heroes”, were received with great affection by a progressively drunk audience, showcasing Wylie’s vocals and the band’s intelligent musicianship. 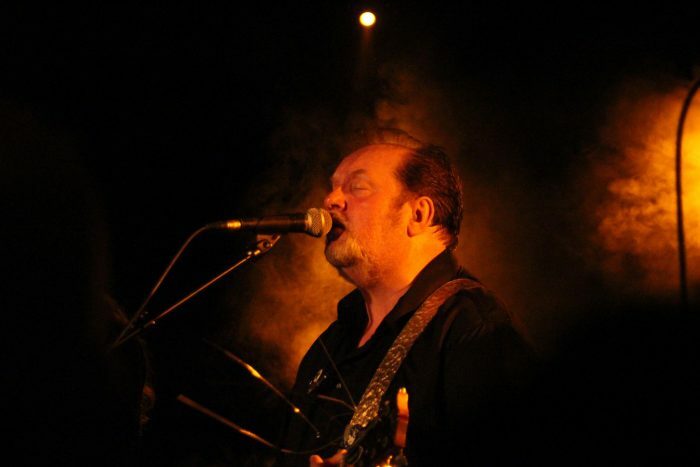 The ethos of Pete Wylie & The Mighty Wah! is clearly to fight for justice, battle on behalf of the underdog, hence the Hillsborough focussed double-header of “You Can’t Put Your Arms Around A Memory” sang by Wylie alone, followed immediately by 1998 anthem “Heart As Big As Liverpool”, pushed all the earlier comedy of the frontman aside and leant a generous slice of sincerity to proceedings. The band should have wrapped the night up with untouchable early 80’s hit “The Story Of The Blues”, thanking everyone from the sound engineer to the bar staff. Unfortunately, the encore “The Resistance Starts Here”, a manifesto about Wylie’s belief in the power of songs, soul, love and rock and roll, was the one real blunder in a fantastic set, sounding hackneyed and generally ordinary. As a comedian, a champion for worthy causes, a musician, a frontman, and as a story-teller, Wylie excels in spades. It was good to see him back north of the border, and hopefully won’t be so long until we do again.